An industry alert recently submitted by the California Independent Oil Marketers Association (CIOMA) highlighted a rising trend in skimmer fraud at Cardlock terminals across California. As we explored in a previous SCL Expert Insight post, skimmers are “small card readers installed within or attached to legitimate payment terminals. They allow thieves the opportunity to steal credit card data from every single swipe of a card. With this sensitive information a thief can clone cards, compromise bank accounts, make fraudulent purchases, steal money and in general, wreak havoc on your identity and financial security.” Skimmers fit over existing card readers found at gas and service station payment terminals and are usually so small that they are nearly impossible to detect. With a small camera attached nearby, thieves are able to see personal identification numbers. With some skimmers, fake PIN pad covers are installed over existing pads to capture your data right from the tip of your fingers. 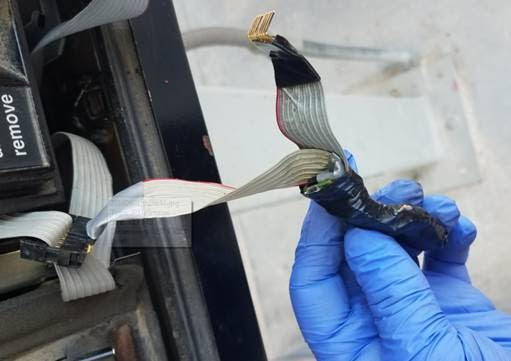 Recently, a Card Reader in Dispenser (CRIND) fuel pump system was discovered to have been tampered with at an unattended Cardlock facility. According to the industry alert submitted by CIOMA, “The reader door was pried open with a crow bar, the lock changed, and the clips were attached to the reader cable. The incident took place in the middle of the night and was discovered the following morning.” Another CRIND reader incident involving the same suspect happened just days later, where the reader was pried open with a crow bar, skimmer installed, the lock replaced with a dummy lock and a fake decal seal installed to make it appear legitimate. On August 22nd, 2018, CIOMA partner, Petroleum Card Services (PCS) – a payment processing company for the petroleum industry – will be hosting a webinar on Card Skimming and Security, exploring best practices for protecting your fleet, your customers and your business. Click HERE for more information on the webinar and to register. If you are a CIOMA member or owner of a fuel service station, do not hesitate to call CIOMA at (916) 646-5999 to report suspicious activity at your pumps. Careful monitoring of stations and immediate reporting whenever you believe there has been tampering to a payment terminal will minimize the number of incidents over time, as well as the proper reporting to government agencies.